Football is an entertaining sport, full of controversy and shock defeats, the latter of which describes Norwich City’s latest loss against non-league side, Luton Town in the FA Cup. Norwich City failed to show up in this game and missed some crucial chances. Leon Barnett came closest to scoring for Norwich as he beat Luton’s goalkeeper in the air, but his effort was denied by the post. This lacklustre performance from the Canaries spurred on Luton and the winning goal came 5 minutes from full-time. Substitute Scott Rendall was the scorer, striking well after some good play down the wing by Stuart Fleetwood and JJ O’Donnell. The team were booed off the pitch as their bad run of form continued and they will be hoping they can get back to their winning ways on Wednesday against Tottenham Hotspur. 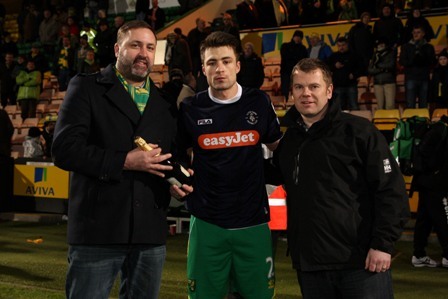 The Anglian Home Improvements Man of the Match was Russell Martin, seen here in a Luton Town shirt.